She finally took to it and boy was she having fun!! And so we don't leave Lily out today...here she is. 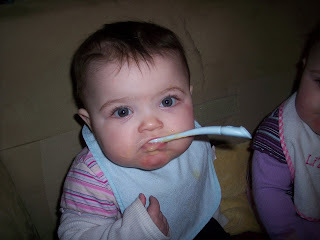 She likes eating so much that when she was finished with her meal, so wouldn't let go of the spoon. She kept it in there for a few MINUTES. Not just seconds. Go Eve go! It makes me want a johnny jumper big enough for me. And Lily is just as cute as ever. Surely one can be made big enough for us! Do you ever take a bad picture of your girls? So cute Kate. I think Tess would love one of those!!! Hmm. A bad picture?? I do believe I have taken those! I'll have to find one! Oh, Kate - your babies are adorable. 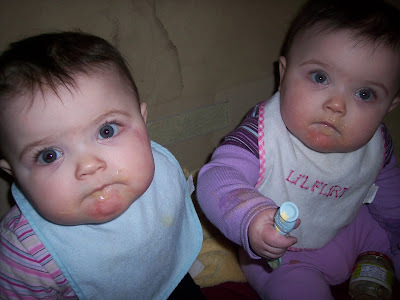 My twins (also girls - monoamnionic) are now 15 years old. You are so blessed! !